This afternoon SpaceX’s Garrett Reisman gave a talk to NASA’s Future In-Space Operations Group regarding SpaceX. During the talk he mentioned the up coming milestones for CCiCap. The Dragon Pad Abort test will be performed from the top of a test structure from SLC-40 as SLC-39 will not be ready in time. The vehicle will include a dummy and prototype seat so that they can gather data during the test on the effects on the crew. The second test will be the in-flight abort test, will be just before Max-Q and will allow SpaceX to determine how they can control the spacecraft as it flies away from the Dragon. 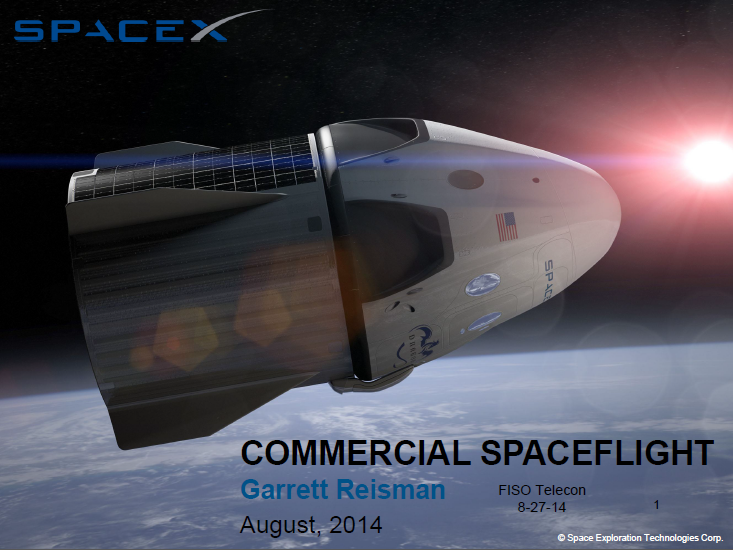 The goal for SpaceX is to fly a Falcon to orbit, land it, refuel and fly again. SpaceX building own docking mechanism for Dragon V2 will be simpler and lighter than shuttle version. Dragon V2 will use parachutes during landing and then fire the Super-Draco engines to cushion the landing. Q) How re-usable will be Dragon V2 be. A) Designed for 10 flights but not going to worry about that for cert, willing to build a new one for each flight. Q) What happens after an launch abort with landing? A) Will always be a water landing, however if the wind drifts you to land it can still land. Q) Range safety for the Texas site? A) Brownsville will only be for commercial to GEO so will be threading through the keyhole between Florida and Mexico so that there isn’t any over flight of land. Q) Raptor engine development status? A) Designed for follow on to Falcon Heavy, currently components are in testing a Stennis. Q) Where there any considerations to building the rockets closer to the launch side to limit the restrains on the design which stops the cores from being larger than 12 feet otherwise additional costs come into play for transportation? A) The follow on to Falcon Heavy will most likely have a larger structure, currently no decision on where this will be manufactured. Q) Is the initial Falcon Heavy flight still on track? A) As far as he knows it is but hasn’t checked the chart recently to be sure. Q) How much will seat be for crewed missions? A) Plan for 7 crew members expected to be $20m cost for fewer crew will increase but unsure of cost. Number of flights per year will also be a factor in the cost per person. Q) Falcon Heavy Shroud – Any plans to have larger on vehicle? A) Current plan is to use the same one as Falcon 9, there is desire for larger but no current plans for bigger. Currently want to keep the same one to reduce the risks and costs of having different sizes. Q) Are the cores the same for the Falcon Heavy? A) Central Core is same, outer cores originally planned to have different plumbing but that may have changed now. Q) Will first FH launch use cross-feed? A) Not sure at present, originally that was the plan. Q) Will the Raptor engine be usable as an upper stage engine in the future? A) Not know at the current time. Q) Dragon recovery process? Parachutes + Propulsion? A) Propulsive is for the final part of the landing, parachutes for main descent. Q) When is the SpaceX IPO? A) No plans at present, Elon has stated that they would like to wait until they have people on Mars. Q) What can you tell us about the F9R incident? A) It looks like it was a single point failure on the F9R, which doesn’t exist on F9. Most likely even if the same failure had happened on F9 it would have continued it’s mission without any issues. Because F9R didn’t have a backup they had to abort the test as it flew outside the bounds of the flight.